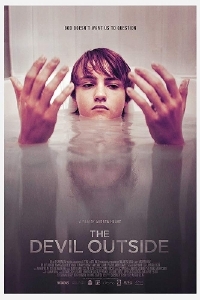 Though Andrew Hulme's sophomore effort The Devil Outside garnered mixed feelings from our contributor Simon who saw the film last year at EIFF, he did note that the psychological thriller is a "sombre British reflection on faith, insanity and questionable parenting techniques" with great performances and frankly, after seeing this trailer, I'm completely sold. Noah Carson stars as Robert, a young man with an unhappy family life, including a mother who is a fanatical evangelical Christian and a father who is largely removed from their lives. Robert's mother is taken with the new preacher in town named David, played by Mark Stobbart, and begins inviting the recovering-addict-turned-preacher to their home. As David begins to exact more of his influence on the family, Robert's reality begins to crack. The trailer for The Devil Outside is exactly in line with Simon's take on the movie; a quiet thriller about a young man dealing with complicated emotions that come from warring influences in his life except in this case, they seem to affect Robert in far worst ways than most. The Devil Outside opens in UK cinemas today.